In addition to posting appealing photos and tracking Yelp reviews, a Yelp business user can also list a menu of their products or services. Putting a menu on a Yelp business page can help ensure that a potential customer finds all the relevant information on a single page. This saves time, but more importantly, it strengthens the accuracy of that Yelp listing. Yelp has a partnership with Eat24 (which is now part of Grubhub) and SinglePlatform, which allows it to automatically import any menu data right into the corresponding Yelp business page. 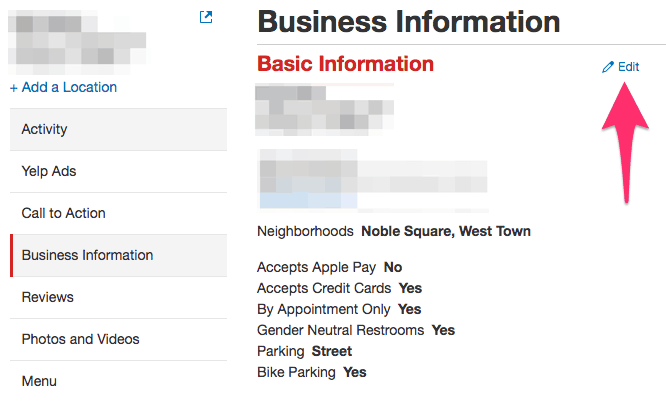 You can see if Yelp imported a business’ menu from either site by going to the “Menu” section in the “Your Business” tab of the Yelp for Business Owners site. If Yelp did grab data from SinglePlatform or Eat24, you should see something along the lines of the text below. 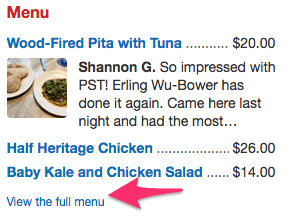 Unfortunately, you can’t make menu changes on Yelp if the data was gathered through Eat24 or SinglePlatform. You’ll need to go to those sites directly to make any modifications. 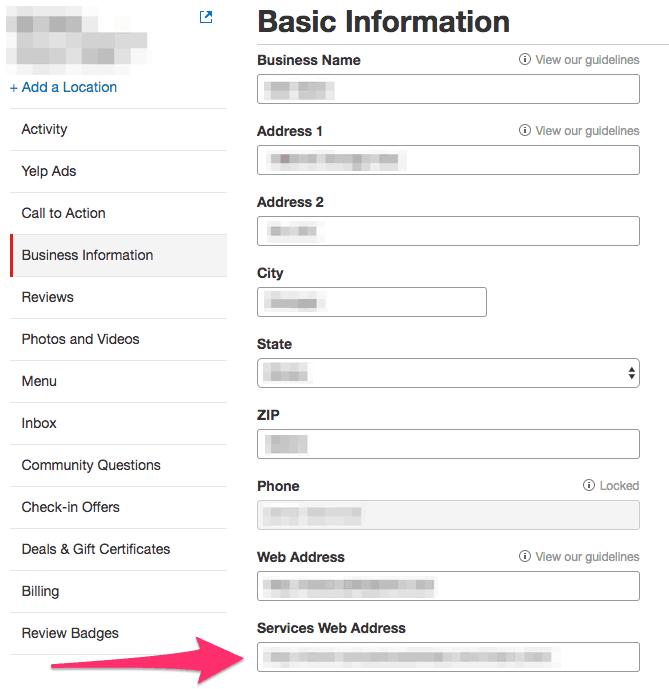 You can find the contact information for either website in the “Menu” section of the Yelp business account. Yelp users can view the menu by clicking on the “Full menu” link on the small table on the right-hand side of the screen. You’ll also get a sneak peek of the menu below the business hours on the same table along with a link to view the full menu. The menu might be on one long page or in several sections depending on how it was set up on Eat24 or SinglePlatform. You’ll see the name of the product or service along with a price and any additional notes. Each entry can also include an actual picture from a user as well as reviews that contain the menu item as a keyword. Sign in to the Yelp for Business Owners site and click on the “Your Business” tab on top of the page. Go to the “Business Information” section and click on the “Edit” link next to the “Basic Information” section. Click “Save Changes” at the bottom of the page to confirm your changes. Yelp will review the changes to make sure it’s correct and accurate. When custom menu URLs were launched in 2011, Yelp also mentioned that it had an algorithm that crawled automatically gathered menu links from business websites. However, it’s unclear if the company still uses that method. Yelp users can also make a business’ menu information more accurate by making suggested edits through the general information card. They can easily find this below the star rating of any Yelp listing. Click on the “Edit” link on a Yelp page’s general information card. A separate page will open, and you can add the right menu URL in the “Menu Web Address” text field. Click “Submit Changes” when they’re done. It should be noted that any user-suggested edits are not automatically implemented. Yelp moderators will need to look at the suggestions and verify its accuracy. Another option is to go to the menu section, which is located on the right-hand side of the page. Yelp users can then view the full menu and notify Yelp of any corrections that need to be made. On the menu section of a Yelp page, click on the “View the full menu” link. This will take you to a separate page that contains the business’ full menu. Scroll to the bottom of the page. A “Submit corrections” link should appear above the site footer section. Click the link to leave feedback. You can either select the “Items incorrect/offered” or the “Wrong menu for this business” option in the dropdown menu that appears. 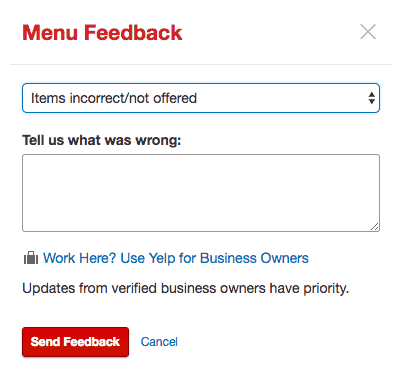 You can leave additional text feedback to make it easier for Yelp moderators to see the incorrect menu information. Click “Send Feedback” when you’re done. (To learn how to update your menu on other review sites, see our articles on Facebook menus and Google My Business menus).